Celebrating his recent Channel swim, Radley College Housemaster Angus McChesney swam a one kilometre stretch of the River Thames through Abingdon, on Sunday, to support the cause of Save Radley Lakes who are trying to prevent the destruction of a cherished local lake by RWE npower, operators of the nearby Didcot ‘A’ Power Station. The event gave out the unmistakable message that the Power Company’s behaviour in this matter is unacceptable, and their customers should show this by switching to another supplier. 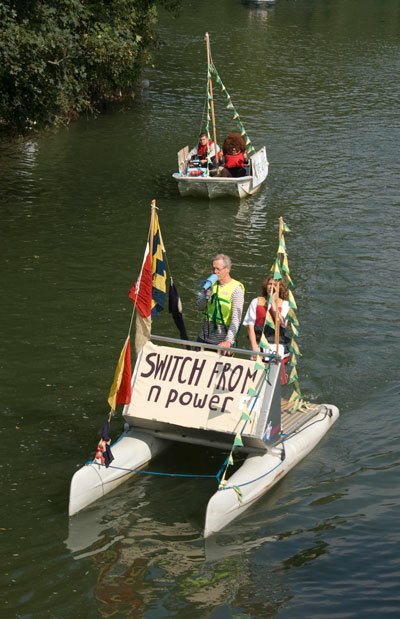 Supported by a flotilla of 3 boats, a kayak, a catamaran and a dory, decked with bunting and placards, and to the sound of cheering and (Swedish) foghorns, local cross-channel swimmer, Angus McChesney, completed the 1km course from Abingdon Lock to St Helen’s Wharf, just beyond the confluence with the Ock, in just 20 minutes. This was faster than anyone was able to follow on foot. On board one of the boats was the Save Radley Lakes Water Vole, complete with life-jacket. 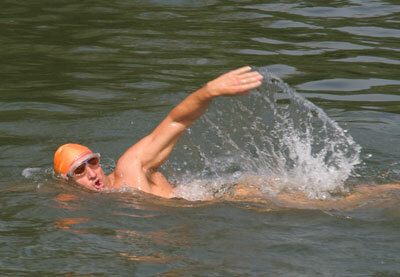 (Health and Safety dictates that even water voles, despite being excellent swimmers, are required to wear these!). The event finally ended with a well earned drink at The Anchor Inn. Indeed this was borne out by the appearance of no fewer than six local councillors to cheer Angus on his way. Also, the people on each bank donated generously towards the Save Radley Lakes legal fund, and the three boats, crews and other assistance were kindly provided by local people and groups, including Abingdon School Rowing Club and Abingdon’s Abbey Sailing Club. Noting the shadowy form of Didcot power station looming in the distance, at the finish of his swim, Angus reminded us how its management has been very successful with ash recycling, even recycling more than they produced last year. Save Radley Lakes claims that recycling ash at Didcot could save up to 250,000 tonnes of CO 2 each year, but not if they throw it in the lake.